Preheat oven to 350F and line a cookie sheet with parchment paper.Make the 'chia egg' by whisking the chia seeds and water in a small bowl. Let sit for 10 minutes to thicken.In a large bowl whisk together the soft coconut oil and coconut sugar. Add the chia egg (or regular egg, if using), vanilla extract, baking soda, salt, and mix until well combined. Add the flour, xanthin gum, and cocoa powder to the wet mixture and mix until combined. 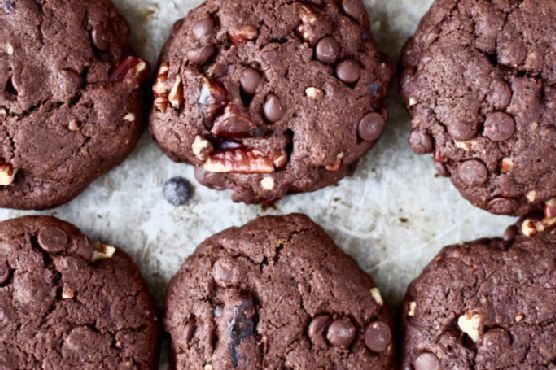 Fold in the chocolate chips, chopped dates, and chopped pecans. .
Place large dollops of batter on the cookie sheet and flatten to inch thick. Make 15 cookies. Bake in the preheated oven for 10 to 12 minutes.